The Rāmāyana (Devanāgarī: रामायण) is an ancient Sanskrit epic attributed to the poet Valmiki and is an important part of the Hindu canon (smṛti). Though ascribed to the sage Valmiki, it derives from oral tradition. Its 24 000 couplets make it one-quarter the length of the Mahabharata. It remains the pre-eminent book for over a hundred million Hindus, for whom it is their main source of spiritual inspiration. It has been translated into almost every Indian language since it inspired a large amount of later-day literature in various languages, notable among which are the works of the sixteenth century Hindi poet Tulsidas and the Tamil poet Kambar of the 13th century. The version of the Ramayana by Tulsidas is known as Ramcharitmanas, and is seen as the fount of Indian religious writing.The Rāmāyaṇa consists of 24,000 verses in seven cantos (kāṇḍas) and tells the story of a prince, Rama of Ayodhya, whose wife Sita is abducted by the demon (Rākshasa) king of Lanka, Rāvana. The characters of Rama, Sita, Lakshmana, Bharata, Hanumān and Rāvana (the villain of the piece) are all fundamental to the cultural consciousness of India. Structure of Valmiki Ramayana Valmiki's Ramayana, the oldest and most widely read version of Ramayana is the basis of all the various version of Ramayana that are prevalent in the various cultures. Valmiki Ramayana has been traditionally divided into seven books, dealing with the life of Rama from his birth to his death. Bala Kanda – Book of the young Rama which details the miraculous birth of Rama, his early life in Ayodhya, his slaying of the demons of the forest at the request of Vishvamitra and his wedding with Sita. Ayodhya Kanda – Book of Ayodhya in which Dasharatha comes to grief over his promise to Kaikeyi and the start of Rama's exile. Aranya Kanda – Book of the Forest which describes Rama's life in the forest and the abduction of Sita by Ravana. Kishkindya Kanda – Book of Kishkinda, the Vanara kingdom in which Rama befriends Sugriva and the Vanara army and begins the search for Sita. Sundara Kanda – Book of Sundara (Hanuman) in which Hanuman travels to Lanka and finds Sita imprisoned there and brings back the good news to Rama. Yuddha Kanda – Book of the War, which narrates the Rama-Ravana war and the return of the successful Rama to Ayodhya and his coronation. Uttara Kanda – Epilogue, which details the life of Rama and Sita after their return to Ayodhya, Sita's banishment and how Sita and Ram pass on to the next world. These two chapters contain most of the mythological interpolations found in the Ramayana, such as the miraculous birth of Rama and his divine nature as well as the numerous legends surrounding Ravana. Dasaratha, forced by one of his wives Kaikeyi commands Rama to relinquish his right to the throne for fourteen years and go into exile by his father. While in exile, Rama kills the demon king Ravana. Sita is the wife of Rama and the daughter of king Janaka. Rama rescues her by defeating the demon king Ravana. He worships Rama and helps find Sita by going to the kingdom of Lanka crossing the great ocean. Lakshmana, the younger brother of Rama, chose to go into exile with him. He spends his time protecting Sita and Rama. He is deceived by Ravana and Maricha into believing that Rama was in trouble while Sita gets abducted. Rama is born a human to defeat him, thus overcoming the boon given by Brahma. Dasharatha is the king of Ayodhya and the father of Rama. Kaikeyi, Dasharatha's favourite queen forces him to make his son Bharata heir apparent and send Rama into exile. Dashatara dies heartbroken after Rama goes into exile. When he learns that his mother Kaikeyi had forced Rama into exile and caused Dasharata to die broken hearted, he storms out of the palace and goes in search of Rama. When Rama refuses to break his exile to return to the capital to assume the throne, he requests and gets Rama's sandals and places them on the throne. Bharata then rules Ayodhya as a representative of Rama. Vishvamitra is the sage who takes Rama into the forest at the behest of defeating the demons destroying his Vedic sacrifices. On the way back he takes Rama into Mithila where Rama sees and falls in love with Sita. Synopsis Rama, the hero of Ramayana, is a popular deity worshiped by Hindus, the route of his wanderings being, each year, trodden by devout pilgrims. According to Hindu tradition, Rama is an incarnation (Avatar), of the god Vishnu, who is part of the Hindu Trinity. Rama's youth Brahma, creator of the universe, could not revoke a boon he gave the demon king Ravana, as a reward for his severe penances, that he should not be slain by gods, demons, or spirits. Brahma went to Vishnu and conveyed the anguish of the gods and requested that Vishnu incarnate on earth as a human to destroy Ravana, as Ravana had not asked for protection against humans or beasts in his wishes to Brahma. Meanwhile, the good king Dasharatha of Ayodhya, who had ruled over his kingdom of Kosala for a long time, was beginning to become anxious about his successor, for he had no sons to take over the kingdom after him. In due course they became pregnant and gave birth to four sons: Queen Kausalya gives birth to the eldest son, Rama. One day, the sage Vishwamitra visited the kingdom and asked King Dasaratha to send Rama to protect him from demons who had been disturbing his sacrifices. Although very reluctant, Dasharatha agreed to send Rama and Lakshmana with Vishwamitra. Towards the end of their stay with Vishwamitra, Rama chanced to pass near the kingdom of Mithila and heard that its king, Janaka, had offered his peerless daughter, Sita, in marriage to the man who could bend the mighty bow of god Siva, which had been kept at Janaka's court. Rama at once determined to accomplish the feat, which had been tried in vain by so many suitors. Rama, without any apparent effort, bent it until it broke and Janaka gladly gave him his beautiful daughter. Rama's exile King Dasaratha, began to feel weary of reigning, and decided to make Rama, his eldest son and heir-apparent, the co-regent (Yuvaraja). She required him, first, to appoint her son Bharata as co-regent and, second, to exile Rama for fourteen years to the terrible forest of Dandaka. Rama, the obedient son, immediately agreed to relinquish his claim to the throne and started to leave for his exile. 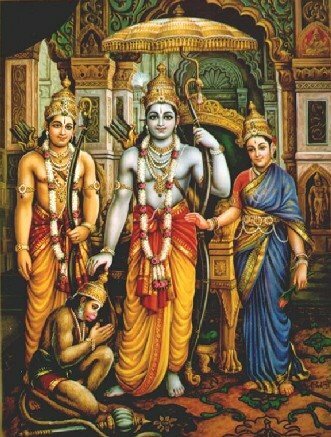 His faithful wife Sita and his loving brother Lakshmana also decided to go along with Rama. With Dasharatha lying grief-stricken, Rama left for the forest, followed by the lamenting people of Ayodhya. Sita's abduction Rama, Sita and Lakshmana left behind Ayodhya and its people, crossed the river Ganges and went into the forest. In the forest, Rama befriended the old vulture-king, Jatayu. Meanwhile, Bharata returned to Ayodhya and, being also devoted to Rama, became furious with Kaikeyi for her role in exiling Rama and for the death of his father. Determined to bring back Rama, he headed for the forest. When he found Rama and pleaded with him to return and assume the throne, Rama politely refused, saying that he was duty-bound to see that his father's promise was fulfilled. Reluctantly Bharata agreed to return to the kingdom, requesting that Rama give to him his sandals. Back in Ayodhya, Baratha placed Rama's sandals on the throne of Ayodhya, and ruled as Rama's proxy from a village called Nandigrama near Ayodhya, awaiting his return. 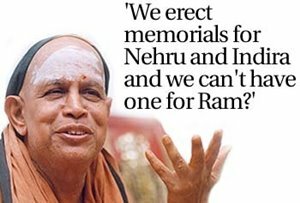 He also vowed to end his own life if Rama failed to return after fourteen years. One day, the rakshasi Surpanakha, a sister of the demon king Ravana, chanced upon Rama's hermitage and saw the handsome Rama and became enamored. Taking the form of a beautiful young girl, she tried to seduce Rama. Rama, ever faithful to his wife Sita, did not respond and asked her to approach Lakshmana. Ravana, after hearing of the beautiful Sita from Surpanakha, resolved to kill Rama in revenge and take Sita for himself. She asked Rama to get it for her, but after Rama left to find it, Maricha began screaming to trick Laksman. Laksman, convinced Rama was in danger, resolved to go out and find his brother. Before leaving Sita alone in the hut, Lakshmana drew a circle in the dirt saying that Sita would be safe as long as she stayed in the circle. Ravana approached the hermitage in the guise of an old man and asked Sita to give him some food. At this moment Ravana grabbed Sita and fled in his airborne vehicle, (Pushpaka Vimana). Jatayu, seeing them fly, attempted to save Sita, but Ravana engaged Jatayu in combat and chopped off the vulture's wings. On returning to the hermitage, Rama and Lakshmana found it empty and anxiously began a search. Through Jatayu, whom they found lying mortally wounded, Rama and Lakshmana learnt of Sita's fate. Vanara kingdom Continuing their search, they encountered the vanara king of Kishkindha, Sugriva, and Hanuman, one of his generals, among whom Sita had dropped from the chariot her scarf and some ornaments. Rama agreed to defeat Vali if Sugriva would assist in the search for Sita. While the duel was progressing, Rama shot from his bow and killed Vali. Sugriva and Rama sent the vanara soldiers in various directions in search of Sita. He found Ravana in his apartments, surrounded by beautiful women, but Sita was not among them. Assuming the form of a tiny monkey, Hanuman crept down the tree, and giving her the ring of Rama, took one from her. He offered to carry her away with him, but Sita declared that Rama must himself come to her rescue, and as proof of finding her Sita gave Hanuman a priceless jewel to take back to Rama. While they were talking together, Ravana appeared, and, after fruitless wooing, announced that if Sita did not yield herself to him in two months he would have her guards "mince her limbs with steel" for his morning repast. In his rage, Hanuman destroyed a mango grove and was captured by the rakshasa guards, and brought before Ravana. Hanuman proclaimed that he was a messenger of Rama, and demanded that Ravana restore Sita to Rama or fall victim to Rama's wrath. Vibhishana, Ravana's righteous brother, intervened and counseled Ravana to follow the scriptures, reminding that it was improper to execute a messenger, and instead told him to exact the appropriate punishment for Hanuman's crime. He leaped back to the mainland, conveyed the news of Sita's captivity to Rama and Sugriva, and was soon engaged in active preparations for the campaign. Battle of Lanka Rama decided that as long as the ocean was not bridged, it was impossible for any one but Hanuman to cross it. Rama meditated for three days with no food , water,and in vain. In his anger at being so ignored, Rama turned his weapons against the ocean, until from the terrified waves arose Varuna, the god of the ocean, who promised him that if Nila and Nala from his army built a bridge, the waves should support the materials as firmly as though it were built on land. Terror reigned in Lanka at the news of the approach of Rama. Vibishana, Ravana's brother, deserted to Rama, because of the demon's rage when he advised him to make peace with Rama. Fiercely fought battles ensued, in which even the gods took part--Vishnu and Indra taking sides with Rama, and the evil spirits fighting with Ravana. After the war had been fought for some time, with varying results, and a great number of troops on both sides were killed, it was decided to determine the victor by single combat between Ravana and Rama. At each shot Rama's mighty bow cut off a head of Ravana, which at once grew back, and the hero was in despair until Vibhishana told him to aim at Ravana's belly-button. Rama took careful aim. As Ravana fell by this weapon, flowers rained from heaven upon the happy victor, and his ears were ravished with celestial music. Touched by the grief of Ravana's widow, Mandodari, Rama ordered a splendid funeral for his foe, and then sought the conquered city. Sita was led forth, beaming with happiness at finding herself re-united to her husband; Rama received her with coldness and with downcast eyes, saying that she could no longer be his wife, after having dwelt in the house of Ravana. but on his continuing to revile her, she ordered her funeral pyre to be built, since she would rather die by fire than live despised by Rama. The sympathy of all the bystanders was with Sita, but Rama saw her enter the flames without a tremor. Her innocence thus publicly proved by the trial by fire, she was welcomed by Rama, whose treatment she tenderly forgave. The conquest won, Ravana defeated, and Sita restored, Rama returned in triumph to Ayodhya, and assumed the governance to the great delight of Bharata and the people of Ayondhya. Sita banished Ayodhya was prosperous, the people were happy, and for a time all went well. It was not long, however, before whispers concerning Sita's long stay in Lanka spread through the city, and Rama came to hear the whisperings that a famine in the country was due to the guilt of Sita, who had suffered the caresses of Ravana while in captivity. Under the pressure from the citizens of Ayodhya, Rama banished her to the forest in which they had spent together the happy years of their exile. Without a murmur the unhappy Sita dragged herself to the forest, and, torn with grief of body and spirit, found the hermitage of Valmiki, where she gave birth to twin sons, Lava and Kush. It chanced that about the time the youths were twenty years old, Rama began to think the gods were angered with him because he had killed Ravana, who was the son of a Brahman. Rama became determined to propitiate them by means of Ashvamedha, the great sacrifice, in which he caused a horse to be turned loose in the forest. When his men couldn't retake the horse, Rama went to the forest in person, only to learn that the youths were his twin sons, Lava and Kush. Struck with remorse, Rama recalled the sufferings of his wife Sita, and on learning that she was at the hermitage of Valmiki, requested her to come with him. Sita had had time to recover from the love of her youth, and the prospect of life with Rama, she felt, was not altogether pleasant. She appealed to the earth, if she had never loved any man but Rama, if her truth and purity were known to the earth, let it open its bosom and take her to it. Morals in Ramayana In his Ramayana, Valmiki expresses his view of human code of conduct through Rama: life is evanescent and the hedonistic approach to it is meaningless. 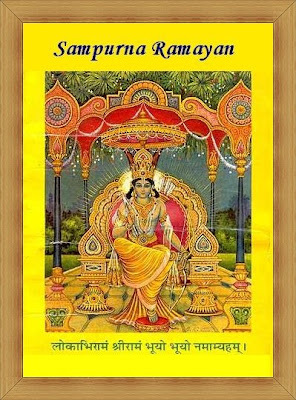 Sankshepa Ramayana, the brief narration of the entire Ramayana story by the sage Narada to Valmiki, forms the first sarga of Valmiki Ramayana. Narada lists the sixteen qualities of the ideal man and says that Rama was the complete man possessing all sixteen of these qualities. Although Rama himself declares "he is but a man, and never once claims to be divine, Rama is regarded by Hindus as one of the most important Avatar of the god Vishnu and as an ideal man. Valmiki portrays Rama not as a supernatural being, but as a human with all the attendant shortcomings, who encounters moral dilemmas but who overcomes these by simply adhering to the dharma--the righteous way. When Rama killed Vali ( See Vali_vadha for a detailed description of the event) to aid Sugriva regain his throne, it was not in fair combat, but while hiding behind a tree. When Sita was freed from Ravana's prison, Rama forced Sita to undergo an ordeal by fire to prove her purity and later as the king, Rama killed the Shudra Shambuka for performing a yogic penance not in keeping with his perceived low station in the society, though this latter incident is contested and may have crept in because of reinterpretation later on. Concept of Dharma-Artha-Kama as per Ramayana The concepts of Dharma, Artha, Kama (and Moksha) are very old Hindu concepts. The first was when Bharat came to forest (Chitrakoot) to meet Rama. Rama asked him whether he followed the rules of Dharma, Artha and Kaama properly. As per Rama it is defined as: Artha should not interfere with Dharma and vice versa. As it is further asked by Rama: The king has to see that there is enough income from taxes, the salaries of the employees are given at proper time and the tax should not be more than 1/6 th (16.6 %) of a person's income. Here Kumbhakarna, Ravana's brother, advises Ravana that one should use dharma in the morning, artha in the daytime and Kaama at night. He further says to Ravana that he (Ravana) is busy with Kaama all the time and this will take him to destruction. Textual history Traditionally the epic belongs to the Treta Yuga, one of the four eons of Hindu chronology and is attributed to Valmiki, is an active participant in the story. The core events told in the epic may well be of even greater age, the names of the characters, Rama, Sita, Dasharata, Janaka, Vasishta and Vishwamitra are all known in the Vedic literature such as the Brahmanas which are older than the Valmiki Ramayana. Brahma, one of the main characters of Ramayana, and Vishnu, who according to Bala Kanda was incarnated as Rama are not Vedic deities, and come first into prominence with the epics themselves (and further during the 'Puranic' period of the later 1st millennium AD). Basham, however, is of the opinion that Rama may have been a minor chief who lived in the 8th or the 7th century BC. Variant versions As in many oral epics, multiple versions of the Ramayana survive. In many Malay versions, Lakshmana is given greater importance than Rama, whose character is considered somewhat weak. Within India There are diverse regional versions of the Ramayana written by various authors in India. Other versions include, a Bengali version by Krittivas in the 14th century, in Oriya by Balarama Das in the 16th century, in Marathi by Sridhara in the 18th century, a Telugu version by Ranganatha in the 15th century, a Kannada Ramayana by the 16th century poet Narahari, Kotha Ramayana in Assamese by the 14th century poet Madhava Kandali and Adhyathma Ramayanam Kilippattu, a Malayalam version by Thunchaththu Ezhuthachan in the 16th century. There is a sub-plot to Ramayana, prevalent in some parts of India relates to the adventures of Ahi Ravana and Mahi Ravana, the evil brother of Ravana, which enhances the role of Hanuman in the story. Hanuman rescues Rama and Lakshmana after they are kidnapped by the Ahi-mahi Ravana at the behest of Ravana and held prisoner in a subterranean cave, ready to be sacrificed to the goddess Kali. There are no major changes in the names of characters except for that of Rama's which is changed to `Laman'. Southeast Asian versions Many other Asian cultures have adapted the Ramayana, resulting in other national epics. Phra Lak Phra Lam is a Lao language version, whose title comes from Lakshmana and Rama. The story of Lakshmana and Rama is told as the previous life of the Buddha. In Hikayat Seri Rama of Malaysia, Dasharatha is the great-grandson of the Prophet Adam. In Ramakien, Sita is the daughter of Ravana and Mandodari (T'os'akanth (=Dasakand) and Mont'o). Vibhisana (P'ip'ek), the astrologer brother of Ravana, predicts calamity from the horoscope of Sita. Contemporary versions Contemporary versions of the Ramayana include Shri Ramayana Darshanam by Dr. K. Ramayana landmarks Amongst the ruins of the Vijayanagara empire near Hampi, is a cave known as Sugriva's Cave. Rama is said to have met Hanuman here. The place is also home to the famous Hazararama temple (Temple of a thousand Ramas).